The Tech volleyball team, coming off a 13-18 effort last season, has better intentions for their second season under head coach Michelle Collier. A Brazil native, Coach Collier came to Tech last season after she took an impressive Jacksonville University Dolphin’s team to the NCAA Tournament. In her first year as coach for the Jackets, the team showed improvements from the previous season in every statistical category and they to do the same this year. As the clock struck noon on Friday, Aug. 28, Yellow Jacket fans swarmed into the O’Keefe Gymnasium to cheer on the volleyball team in their season opener against the Siena Bulldogs. This was the team’s first match in the two-day, four-match invitational known as the Georgia Tech Courtyard by Marriott Atlanta Midtown Invitational, and the Jackets were out for a victory. Led by offense from juniors Teegan Van Gunst and Lauren Pitz who both had 9 kills, the team played with unity and ferocity, sweeping the Bulldogs in three sets: 25-14, 25-17 and 25-17. Later that day, the Jackets were met with a challenge they could not surmount. In a match that went into the fifth set, Tech was upended by the Coastal Carolina Chanticleers. 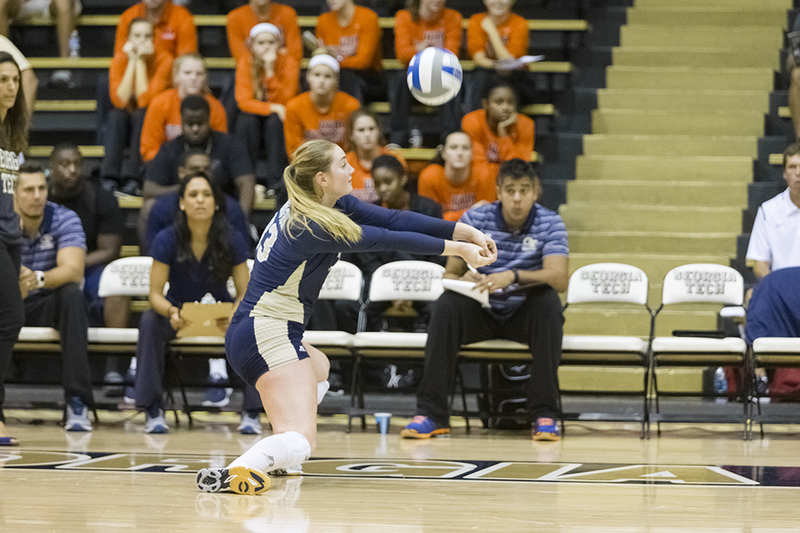 The Jackets won the first set, 25-17, and appeared to be on their way to another victory; however, in the second and third frames, Tech looked unwonted, struggling to find its rhythm. Tech narrowly evaded defeat in the fourth leg of the match, escaping with a 25-23 win, but in a fifteen-point fifth set, the Chanticleers caught fire, winning the set 15-9 and the match 3-2. A five-set match would not have been possible were it not for the performances of the Van Gunst twins, juniors Teegan and Annika, who both had huge matches. To this response, the stats serve as evidence. Annika had 13 kills and 13 digs while Teegan amassed 22 kills and 13 digs. Though losing is never easy, the Jackets were not enervated by the defeat. “We just have to get past this one and move on to the next two this weekend,” T. Van Gunst said. And move on they did. In the two Saturday matches, Tech played with a vendetta, embarrassing their two opponents by a point total of 150-80. In their noon contest against UT-Martin, the Jackets exercised more precision and volition than they did in their match versus Coastal Carolina, limiting themselves to only eleven errors. En route to thumping the Skyhawks, junior London Ackerman provided five aces, while sophomore Sydney Wilson was mimicked by Annika as they contributed 11 kills apiece. If hunger for redemption was the motivation for the UT-Martin match, it was the status quo for the Citadel match as Tech played every point with an edge. Junior Ashley Askin’s performance was particularly compelling as she racked up 11 kills and 10 digs throughout the match. Sweeping the Bulldogs to wrap up the invitational, the Jackets now find themselves with a 3-1 record and an entire season ahead of themselves. Moving forward, the Jackets look to do as all great teams have done and turn this early season momentum into a year in which the Tech volleyball team will be remembered.